Rosemary Magaña, a licensed clinical professional counselor and staff therapist at Counseling and Psychological Services, leads a discussion with Northwestern’s minority journalism groups about mental health in journalism. Magaña spoke about different types of illnesses caused by covering stressful or traumatic stories and healthy ways to cope. 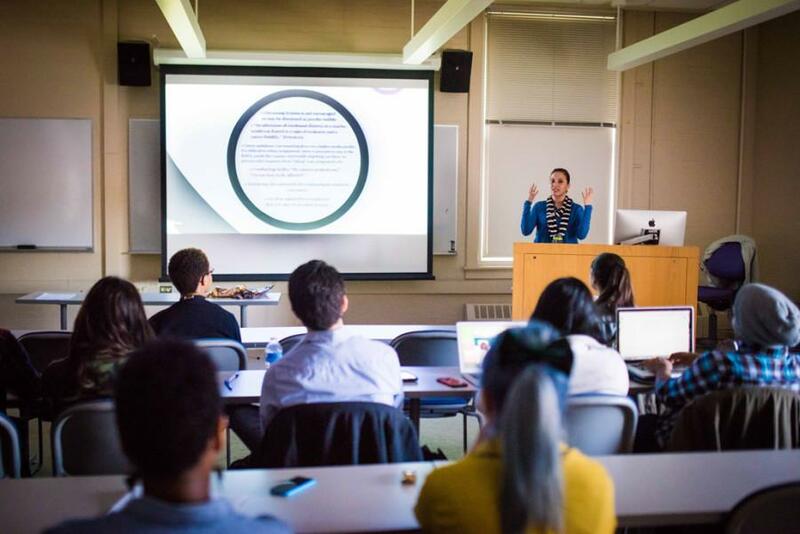 A Counseling and Psychological Services representative led a presentation and discussion with about 20 members of Northwestern’s minority journalism associations about mental health awareness in journalism Tuesday evening in Fisk Hall. Rosemary Magaña, a licensed clinical professional counselor and staff therapist at CAPS, worked with the National Association of Hispanic Journalists, the National Association of Black Journalists and the Asian American Journalists Association to create a program to educate journalism students about being aware of how covering traumatic events can affect their mental health. Magaña’s presentation highlighted different types of illnesses caused by stress or trauma and healthy ways to cope. “In journalism, in that field and culture, there’s a history of not always having great insight into how their work may be affecting them and their mental health,” Magaña told The Daily. During the presentation, Magaña cited data gathered from a psychology study about war journalists conducted by Anthony Feinstein. The study revealed that many reporters did not even realize they experienced trauma and were being psychologically affected by it. “They themselves feel like ‘it didn’t happen to me’ and ‘this is just my job,’ so they don’t focus on how it could be affecting them overall listening to these very traumatic stories or being in dangerous situations,” said Magaña. Carson Brown, NABJ treasurer and Medill sophomore, said in her experience, mental health in journalism is rarely talked about, which she said she thinks is worrisome. Magaña’s presentation emphasized the importance of changing the way mental health is addressed the journalism field by engaging attendees in discussion about the topic. Communication senior Jackie Marthouse, who oversees NAHJ’s public relations, coordinated the event. Marthouse, a Daily staffer, said the presentation opened her eyes to the role one’s career can have on mental health. “I didn’t realize how much this field could affect how I felt self-wise, like self-awareness and self-health,” Marthouse said.